Anil Kapoor and wife Sunita Kapoor are on a family vacation with daughters Sonam Kapoor and Rhea Kapoor. 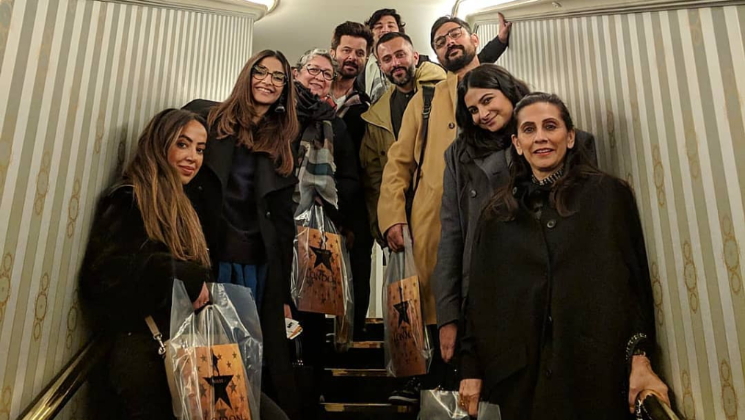 Sonam’s husband Anand Ahuja and Rhea’s rumoured boyfriend Karan Boolani and a few other family members are also with them enjoying the cool climate of London. Rhea shared few pictures from their family outing as they went to see Hamilton musical. Rhea’s rumoured boyfriend Karan Boolani took to his Instagram to share a glimpse of the musical. In the pictures, the family is seen posing in black. The only person missing from the family picture is Harshvardhan Kapoor who is apparently prepping for his Abhinav Bindra biopic. The Kapoor family had spent their summer vacation in London and now it seems that the Kapoors will be celebrating Diwali in the British capital. After seeing these pictures one thing is for sure that the family who vacays together stays together. Don’t you guys agree? On the work front, Sonam Kapoor has been shooting for her upcoming film ‘The Zoya Factor’ co-starring Dulquer Salmaan and Sanjay Kapoor. The actress will also share screen space with father Anil Kapoor for the first time in ‘Ek Ladki Ko Dekha Toh Aisa Laga’ co-starring Rajkummar Rao and Juhi Chawla. The film is set to release in February 2019. Anil Kapoor will also feature in ‘Total Dhamaal’ starring Ajar Devgn and Arshad Warsi.